Newly available Stasi notes of meetings between Soviet and East German security heads between 1981 and 1984 provide unprecedented details of Operation RYaN, the Soviet intelligence effort to detect and preempt a Western “surprise nuclear missile attack,” that contributed to the risk of nuclear war through miscalculation during the 1983 Able Archer nuclear war scare. 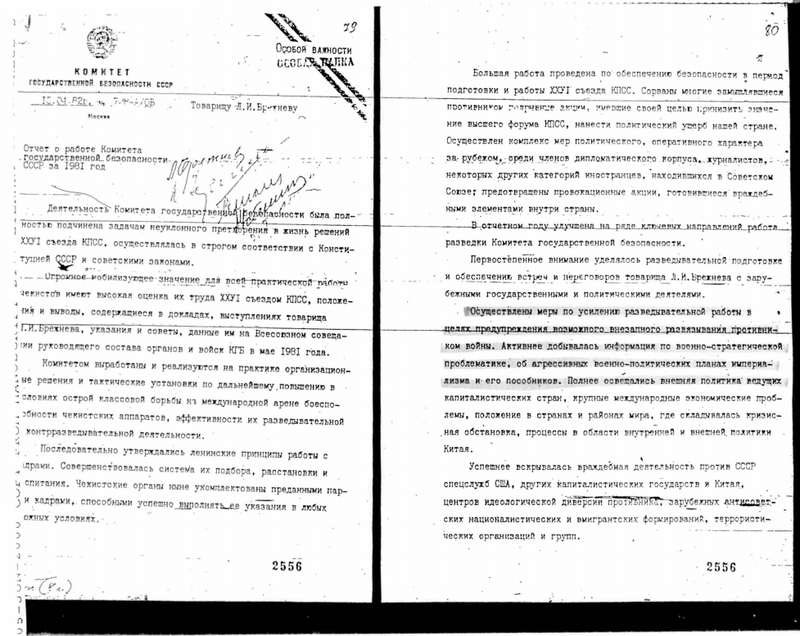 These documents provide operational details to the scanty documentary record of Operation RYaN; disclose that the KGB received funding to create 300 new positions so that it could monitor and report on a Western nuclear first strike (that the West had never contemplated); and hint at Stasi –and KGB– concerns over lack of “clear-headedness about the entire RYaN complex,” inferring that Operation RYaN increased, rather than decreased, the danger of nuclear war. 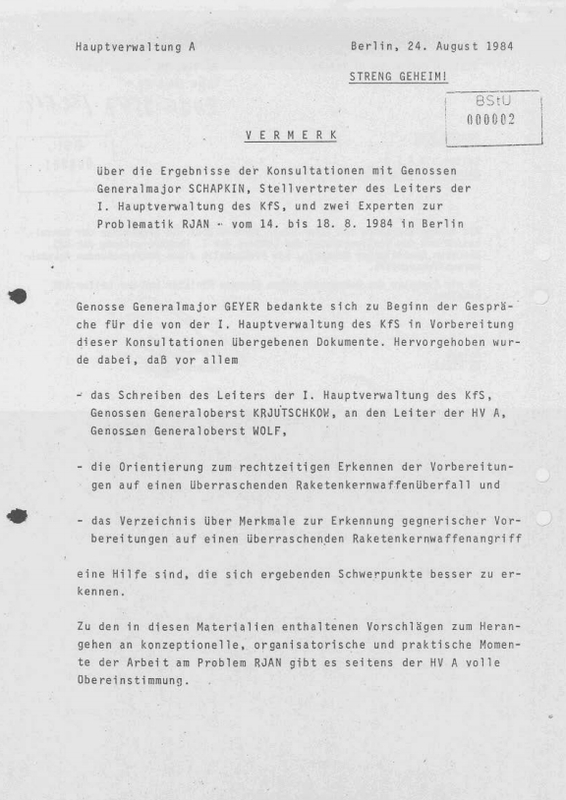 These Stasi memorandums of conversations at the highest levels were released by the Office of the Federal Commissioner for the Records of the State Security Service of the Former German Democratic Republic (BStU), translated to English by Bernd Schaefer, and introduced, posted, and contextualized (in a collection of nine documents dating to 1964) by Walter Süß and Douglas Selvage in a Cold War International History Project e-dossier. 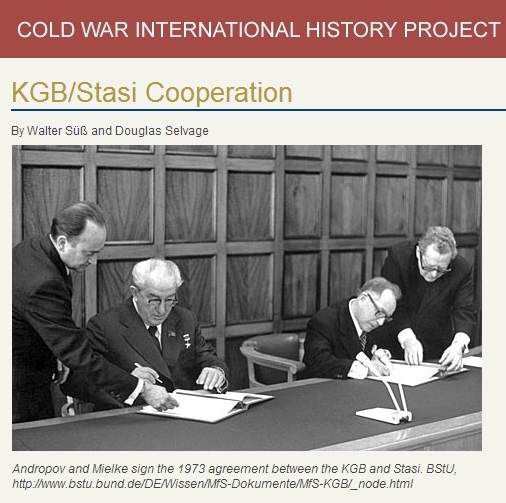 The release reinforces the need for international archival research and collaboration to more fully unravel the mystery of the “last paroxysm” of the Cold War, and stands as a stark and important contrast to the improper and absurd national security claims used by American and British intelligence agencies to prevent the release of information about this nuclear war scare. Operation RYaN –RYaN(РЯН) is the Russian acronym for Raketno-Yadernoye Napadenie (Ракетно ядерное нападение), оr “nuclear missile attack”– began in May 1981. At a major KGB conference in Moscow, General Secretary Leonid Brezhnev and Yuri Andropov, then Chairman of the KGB, announced the creation of Operation RYaN because, they claimed, the United States was “actively preparing for nuclear war” against the Soviet Union and its allies. The most comprehensive account of Operation RYaN remains a Top Secret February 1983 telegram from KGB Headquarters Moscow to the London KGB Residency entitled “Permanent operational assignment to uncover NATO preparations for a nuclear missile attack on the USSR,” with enclosed instructions on how to report on indicators pointing toward a nuclear sneak attack. 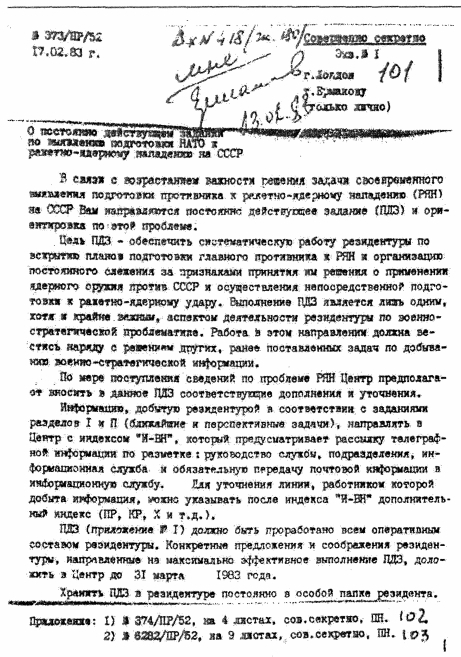 This document was published in full in 1991 by Soviet double agent Oleg Gordievsky (who alerted MI6, which then warned the US, of the danger of Able Archer 83) and British intelligence historian Christopher Andrew in Comrade Kryuchkov’s Instructions: Top Secret Files on KGB Foreign Operations, 1975-1985. Attached to the telegram was a list of seven “immediate” and thirteen “prospective” tasks for the agents to complete and report. These included: the collection of data on potential places of evacuation and shelter, an appraisal of the level of blood held in blood banks, observation of places where nuclear decisions were made and where nuclear weapons were stored, observation of key nuclear decision makers, observation of lines of communication, reconnaissance of the heads of churches and banks, and surveillance of security services and military installations. Regrettably however, Comrade Kryuchkov’s Instructions included a facsimile reproduction of only the first page of this document. The additional pages were translated and typeset into English with no Russian corroboration of their authenticity. Nevertheless, the KGB annual reports, as well as documents from other former Eastern Bloc (Czechoslovakian and Bulgarian) archives have helped to substantiate Gordievsky’s accounts. Hard numbers revealing that within the KGB, 300 positions were created so that RYaN operatives could implement the real-time “transmission and evaluation” of reported indicators showing the likelihood of a Western first strike. This puts an actual number on the people required to conduct Operation RYaN, previously called “the largest peacetime intelligence gathering operation in history.” In July of 1984, KGB chairman Victor Chebrikov created a new division within the First Department (Information) of the KGB’s First Main Directorate (responsible for foreign intelligence and operations) to implement Operation RYaN throughout the KGB and world. This coordinating division was composed of 50 KGB officers. It is possible (see below) that this new coordinating division was created as a reaction to the false alerts generated by Operation RYaN in November 1983 incorrectly warning that a NATO nuclear release drill, Able Archer 83, could have been an actual nuclear attack. 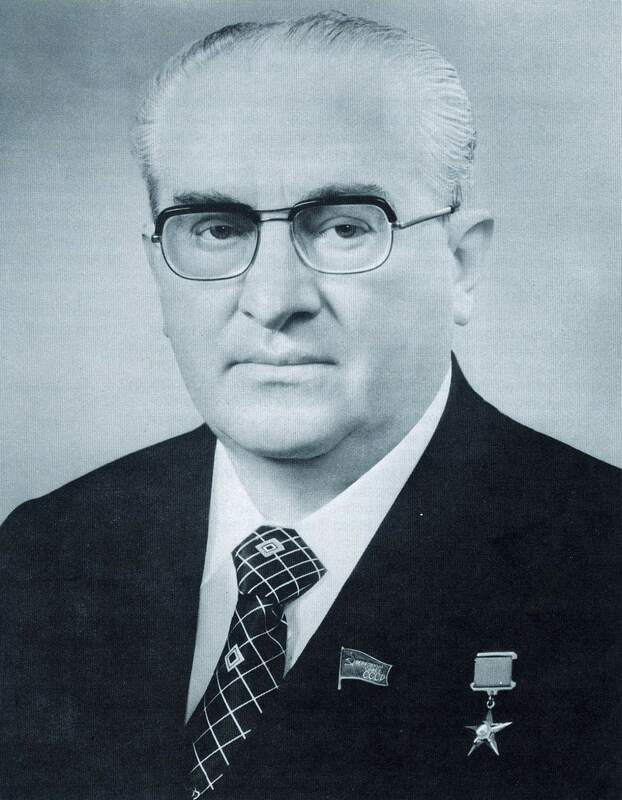 KGB Chairman and General Secretary Yuri Andropov circa 1983. 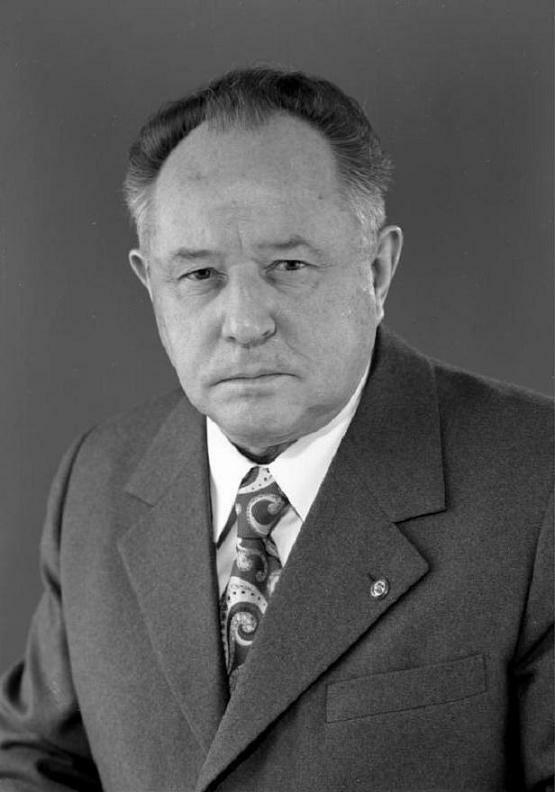 Deputy KGB Chairman (later Chairman) Vladimir Kryuchkov. A confirmation that, as of September 1983, Soviet General Secretary Yuri Andropov, remained in charge of the Soviet Union. Deputy Chairman of the KGB Vladimir Kryuchkov told Stasi head Erich Mielke that although Andropov was officially on vacation in the Southern USSR, it was “no actual vacation… For half the day he is reading information, including ours [KGB] and what we received from you.” This account squares with those provided by Soviet historian Roy Medvedev and Marahal Nikolai Ogarkov that describe how Andropov would summon his advisors, generals, and Politburo members to his hospital bed to govern the Soviet Union. 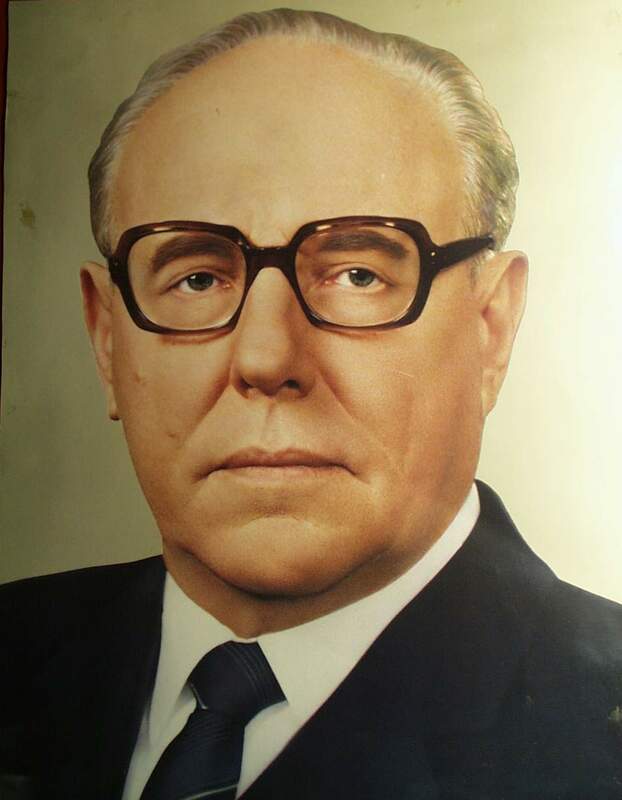 It was there that Orgarkov described Andropov as “fully engaged in the leadership of the country and the army, and the defense of the country.” Despite his absence from public view, Andropov remained the leader of the Politburo. However, key discussions during Andropov’s tenure as General Secretary did not occur in formal Politburo meetings, but at his hospital bedside. Evidence showing the Soviets believed KAL flight 007 –which was shot down by a Soviet jet over the sea of Japan on September 1, 1983– was a military, rather than civilian aircraft. 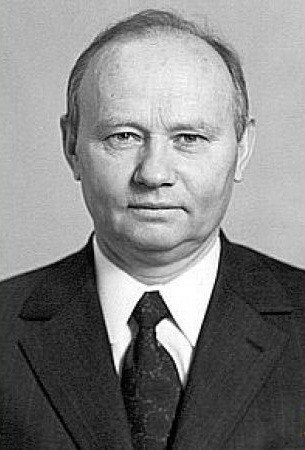 Deputy Chairman of the KGB Vladimir Kryuchkov opened the September 19, 1983, meeting by quipping “you do not shoot down such a type of airplane once a month,” and spent the majority of the meeting attempting to explain the Soviet rationale and decision to shoot down the plane. 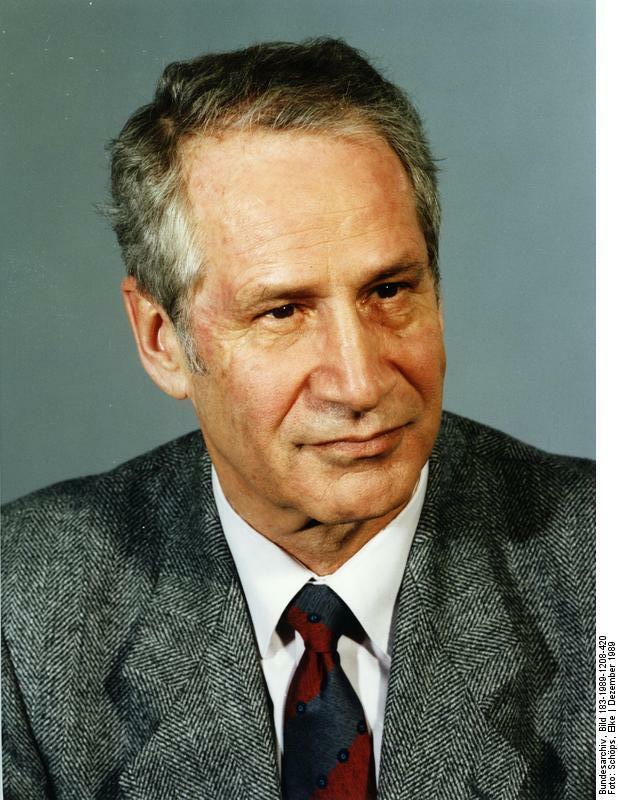 Kryuchkov explained to Mielke that “we were convinced that it was a military aircraft” and that Soviet radar vulnerabilities prevented real time tracking of the aircraft and contributed to the Soviet’s horrific decision to mistakenly kill all 269 passengers aboard. The inability of Soviet radar to track incoming aircraft (a vulnerability tested repeatedly since the beginning of the Reagan administration) contributed to the USSR’s reliance on human intelligence (Operation RYaN) and to their misreading of other indicators during Able Archer 83. The release and dissemination of these revealing Operation RYaN documents by the German government and the Cold War International History Project are a refreshing departure from the secrecy still cloaking documents about the 1983 War Scare in Moscow, Washington, and other capitals. These revelations also serve as a clarion call for historians to continue pressing for the declassification of the events and reasons which increased the risk of nuclear war through miscalculation during the 1983 War Scare. Other sources vary the spelling of RYaN. Soviet Ambassador to the United States Anatoly Dobrynin spelled it “ryon.” Another spelling includes the word “suprise:” “VRYAN” “vnezapnoe raketno yadernoe napadenie” —surprise nuclear missile attack. Czech Intelligence referred to the operation as NRJAN. 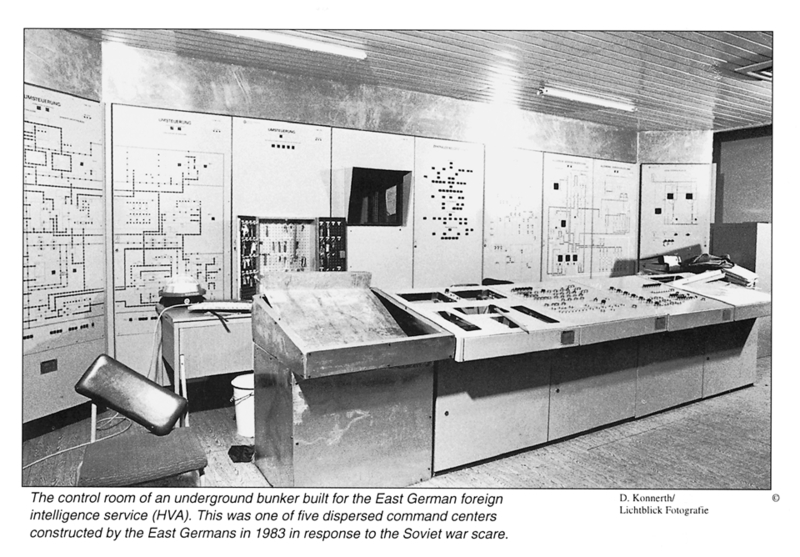 One document shows that the Bulgarians monitored “VRYAN indicators” as late as June 1987, and other East German documents show that the operation continued until 1990. Robert Fairly once quipped to me on Blogging Heads, that the KGB was not the only national security bureaucracy to lobby for and create large, unnecessary, and ineffective programs to spawn positions for its employees. See also: Kyl-Lott Review. 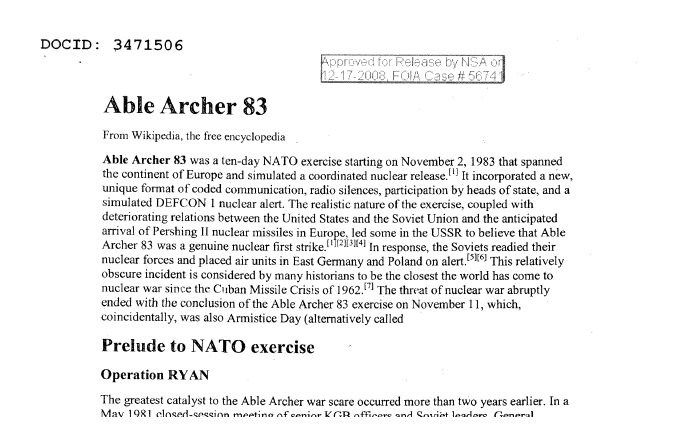 For more on the 1983 War Scare see The Able Archer 83 Sourcebook and Countdown to Declassification: Finding Answers to a 1983 War Scare. Of course “Operation RYaN increased, rather than decreased, the danger of nuclear war.” It’s purpose not not to prevent war, but to indicate the last window of opportunity for a first-strike that would leave the USSR on a favorable footing following an initial nuclear exchange. Without RYaN, USSR leadership would have wait for an actual first strike by NATO, and then react. The USSR was on launch-on-warning footing prior to RYaN, and while this was considered adequate, NATO’s impending deployment of Gryphon and Pershing-2 missiles in Europe made launch-on-working no good anymore, as there would be insufficient warning to react to a decapitation and counterforce strike. Therefore, they needed some way to try to predict an impending NATO attack before it occurred, so that a preemptive strike could be employed. The question was not IF, but WHEN.